Most criminal convictions in Arizona and throughout the United States result from plea agreements. If you face criminal or DUI charges, the ideal outcome is to have charges dismissed. Dismissals however, do not occur as frequently as plea agreement resolutions. Depending on the charges you may qualify for deferred prosecution as a means of getting your criminal charges dismissed. When a dismissal of the charges is not possible, you will likely be asked to enter a plea agreement to resolve them. Most courts encourage plea agreements because they help prosecutors close cases faster; reduce court caseloads; and preserve costs and resources required for trials. 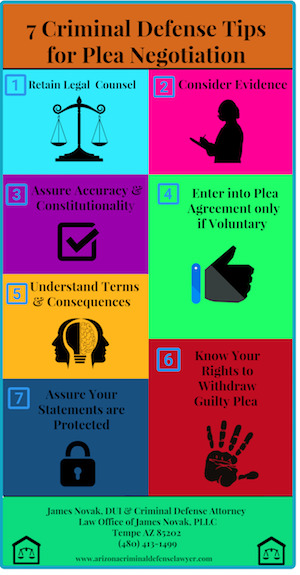 Below are some frequently asked questions and answers about plea agreements including 7 ways you can protect your rights throughout the process. A plea agreement is a means by which criminal charges are resolved without a trial. The terms of resolution are agreed upon by the prosecution and defense, and approved by the judge. In a plea agreement, the defendant is required to enter a guilty plea for specified charges in exchange for a more lenient sentence. Plea agreements are also known as plea bargains, negotiated pleas, or plea deals. Under the Arizona Rules of Criminal Procedure, the parties may negotiate any terms of the plea agreement in order to resolve it without trial. The plea bargain must be fair, constitutional and in compliance with legal standards. The defendant must enter it knowingly and voluntarily. After an agreement is reached it is submitted to the court. The judge, then approves or rejects it the court’s discretion. What are the advantages of entering a plea agreement? What are the disadvantages of a plea agreement? Many different terms of resolution can be negotiated in the agreement. These will differ depending on circumstances including nature and classification of charges, and the defendant’s criminal record if applicable. Compliance with all terms of agreement including probation. The only terms that are not negotiable are the requirements that the defendant plead guilty or no-contest to certain charges, and waive their trial rights. Under Arizona Court Rules 17.4, a document is crafted which reflects the terms agreed upon by the parties. The prosecution, the defendant and their attorney if applicable, will then sign it and it will be submitted to the court for approval. The judge may accept or reject the recommended plea at his or her discretion. If the court rejects the plea agreement, it will provide the defendant with the opportunity to withdraw their plea. The judge will also inform the defendant that if the case goes to trial, the outcome may be less favorable than the plea agreement. If the parties are unable to reach an agreement or it is rejected by the court, the case will proceed to trial. If a guilty plea is withdrawn by the defendant because the plea agreement was rejected, the defendant will get a change of judge upon request. How can I protect my rights in the plea agreement process? Retain a criminal defense attorney as early as possible: Once the prosecution puts an offer on the table, they are less likely to improve substantially on the offer after you hire an attorney. You criminal defense attorney should be a strong negotiator, and work to obtain the best possible terms based on the circumstances in your case. When the prosecution extends an officer, it is not obligated to look out for your best interests, or make sure your rights are protected. While the prosecution’s offer may meet legal standards, it may not be fair or just to you, considering the evidence and circumstances of your charges. Consider the strengths and weaknesses of the case. An experienced criminal defense attorney will point out weaknesses in the prosecution’s case; introduce favorable evidence, and mitigating factors in your defense. An effective attorney will leverage these factors against the recommended sentencing terms to get the most favorable outcome in the agreement. Be sure terms are accurate and do not violate your rights: Plea agreements are an area of the criminal justice process where errors can easily occur. The written agreement should reflect precisely what was agreed upon. The terms in the agreement should be constitutional, and no provisions are in violation of your rights. Make sure you enter the agreement voluntarily. Your decision to enter a plea agreement and plead guilty must be completely voluntary, and not coerced. You don’t have to accept the terms or sign the agreement. You still have your right to take your case to trial. Make sure you understand the agreement. 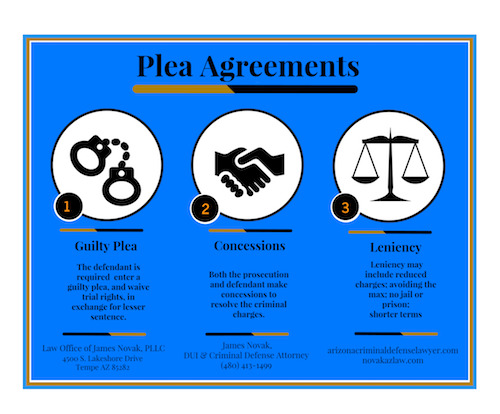 In order for the plea agreement to be valid, you should understand the terms you are agreeing to and the consequences of your plea. The record must show that you knowingly entered the agreement; were informed about the terms, and understood the specified rights you were waiving certain rights outlined in the agreement. Your right to withdraw your guilty plea: You have the right to withdraw your plea and revoke the agreement, before the judge approves it. After that, a motion for plea withdrawal may be filed at the judge’s discretion. Incriminating statements should not be used against you. In any stage of the criminal process, it is a good idea to keep in mind your Miranda rights. While statements you make to further plea negotiations are protected under the Rule 10 of Arizona Rules of Criminal Procedure, you want to be sure you any incriminating statements are not used to prosecute you if you can’t agree upon terms. This is another reason why it is important to retain a criminal defense attorney. An effective criminal defense attorney will protect your rights and make sure your statements are not used against you. They will work closely with you and the prosecution and will be your voice throughout the process. You should not begin discussions or negotiations with the prosecution until you have at least consulted an experienced criminal lawyer. Plea agreements may be offered for nearly all types of charges. They are frequently offered and accepted in drug offense cases, when the defendant does not qualify for deferred prosecution. Due to the exposure of long term prison sentencing for drug convictions, defendants generally do not want to risk being found guilty at trial. Marijuana possession and use is one of the most common drug charges that are brought in Arizona. Possession and use of marijuana outside of the provisions afforded by the Arizona Medical Marijuana Act is still illegal in this state. Mere possession of illegal drugs can result in harsh sentencing including prison terms. Those found guilty of marijuana possession, will be exposed to harsh felony sentencing. The state imposes prison sentencing of ranges from 6 months to 1.5 years for possession less than 2 pounds for personal use, a felony records, fines, fees, assessments, drug counseling or treatment, and other penalties the court deems appropriate. Under the Sixth Amendment of the U.S. Constitution you have the right to defend your charges, the right to due process, and the right to a fair trial. The decision of whether or not to accept a plea agreement or deferred sentencing is one of the most important decisions you will make regarding their charges. If you enter into a plea agreement, you should do so voluntarily, and with an informed understanding of the benefits and disadvantages. These are areas that can easily result in error, unfair terms, or rights violations, particularly in the case of plea agreements. Your criminal defense attorney will make sure that the terms offered by the prosecution for a plea agreement are fair, constitutional, and accurate. The best agreements are the product of an experienced and criminal defense attorney with strong trial negotiation skill like James Novak DUI and Criminal Defense Attorney. Even if the prosecution tells you that you do not need an attorney, it is still wise to consult one long before an offer is extended. If the prosecution extends an offer before you retain an attorney they are less likely to provide better terms if you later hire your own criminal defense attorney. Your chances of getting a favorable resolution increases when you retain a criminal defense attorney, like James Novak of the Law Office of James Novak, to begin early and proactively working with the prosecution on your behalf. 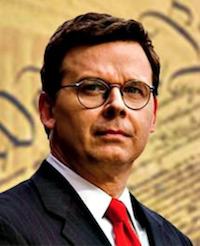 James Novak is a former prosecutor and experienced criminal defense attorney. Attorney James Novak, will be your legal advocate in the criminal justice system. He will make sure your rights are protected, and provide a strong criminal defense, for your DUI or criminal charges. If retained he will evaluate your case and create an effective defense strategy that is the most likely to lead to a favorable outcome in your case. James Novak of the Law Office of James Novak, PLLC offers a free initial consultation for those facing active charges. He defends clients in Phoenix, Tempe, Mesa, Chandler, Gilbert, and Scottsdale AZ. If you face active DUI or criminal charges contact or call the Law Office of James Novak today at (480) 413-1499 and speak with James Novak, regarding your matter.